About a year or so ago, I had to delete my old blog for personal reasons but after everything patched up for me, I was ready to come back and keep doing the thing I started to absolutely love doing for the past year: blog about anime/otaku topics. 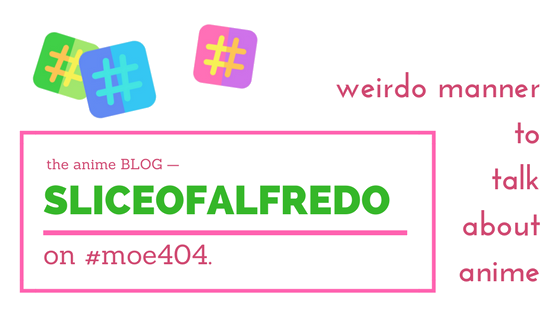 I restarted the Slice of Alfredo blog on February 10th, 2018, purposely on my birthday, since I thought it would be special to restart on a date I am definitely familiar with… plus it’s convenient to celebrate multiple things on one day 😛 I’m surprised I didn’t actually go in more detail about the past year in the 2018 reflection post I wrote earlier, but I guess this is a great opportunity to do so. Despite being very inconsistent throughout the year and having multiple cases of “writer’s block”, I honestly believe 2018 was one of the best years I’ve experienced as an anime/J-culture blogger, and for a ton of reasons. I was able to discuss and dive deeper into certain topics that were derived from anime such as music and the voice actor culture, and pretty much helped me develop the kind of content I enjoy following and talking about consistently on the blog and social media. Last thing I wanted to talk about is you guys. I’ve met a ton of cool and interesting people throughout 2018 and I’m just really happy that happened last year. Being surrounded by people who enjoy the same things as me and having intriguing conversations with them is something I didn’t really experience outside of this community (until more recently) but I appreciate all of you who I’ve met, spoken to, read posts from, followed on Twitter, etc. I’ve said this many times before but all of you are the main reason why I enjoy blogging and still have a huge interest in writing about what I write about, and I just can’t thank you all enough. Next: Next post: The Kabe-don: Do People Actually Do This? Keep up the great work this year and I hope you have an awesome birthday! Happy Birthday and Conga-rats on the blog-a-versary!